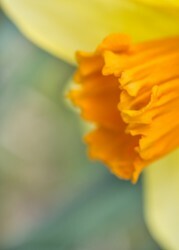 Spring flowers and buds are great subjects for close-up or macro photography. Extension tubes, close-up filters and macro lenses will help you get closer to the subject, but you don’t really need special gear. Most lenses today will let you focus on a subject within a few feet of the lens. Cameras today have very high resolution, so you can then crop the image for a closer view. Change Perspective. A picture of a flower taken from eye level while pointing the camera down at a 90 degree angle is very boring. Get down on the ground and shoot perpendicular to the flowers, or stand right above them and shoot down. Blur the background. Shallow depth of field works great for close-ups, so try shooting wide open. Increase your depth of field. Or go the other way. If you want more depth of field, try Focus Stacking. It’s sort of like HDR for depth of field because you take several shots and then blend them together into a single composite. You’ll need a tripod to do it. First, frame your picture. Then take several shots focusing at different points in the scene. Start by focusing on some thing close in, and then gradually move your focus point outward. This works for both close-ups and landscapes. Photoshop and Photoshop Elements have built-in functions that let you blend the images together. here’s an article with more details on Focus Stacking with Photoshop and Elements. Shoot the weather. Grey skies, blue skies, rain, wind — it’ll all work. 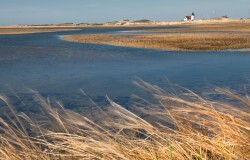 One thing about Cape Cod is that we have plenty of wind. So work it into your pictures. If the wind is blowing hard, you can use a fast shutter speed to try and freeze the movement of the grass, trees or whatever. Or you can use a slow shutter speed and blur the movement to convey a sense of motion. Design Your Picture. It’s just like any type of photography. Look for lines, patterns, textures and shapes to use as elements to organize composition. Dress for the season. This may seem like a no-brainer, but spring is tricky weather-wise. A warm sunny day can turn cool very quickly. April showers bring soggy ground. Pack a camera raincoat or plastic bag for your camera. Look for shadows and contrast. Since most trees still don’t have their leaves, the branches cast interesting shadows on the ground. Spring is transitional. There’s still a lot of brown and grey, so use it as a background to contrast against the bright colors of tulips, budding leaves, etc. Check the light. Backlighting is beautiful on flowers and new leaves. Go wide. The spring landscape is filled with subtle colors. Use strong colors in the foreground as a focal point. Or capture the soft colors of budding branches in the brush on the opposite side of a pond, lake or field .